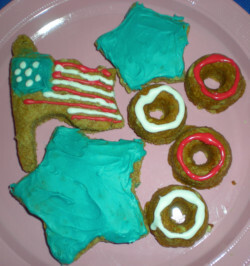 Easy recipe for Fourth of July cookies for your four-legged guests at your celebration. These homemade dog biscuits take a minimum amount of time and preparation but will add a big bang to your party! Mix the water, oil and biscuit mix to form a dough. Roll out dough into a thin sheet. Press out desired shapes with cookie cutters. Bake on cookie sheet for 18-22 minutes. Turn off oven and let dog cookies sit another 60 minutes to dry out and harden. Mix up #Magifrost according to the package directions (add right amount of water for the type of decoration you want and stir!) It will be white in color. Divide the mixture into 3 small bowls. Add blue icing color to one, red to another, and leave the third white. Make sure you keep your dog cool and well-hydrated during the hot, summer months. A dog's normal body temperature lies between 100.5 and 102.5 degrees, which is the temperature of a fever in humans. Dog body temperatures rising to 105 are dangerous. Dogs do not sweat. They pant to release heat and regulate their body temperature. Give him small sips of cold water. Don't let him gulp it down which could lead to bloating. Never leave your dog in a hot, parked car, even with the windows open. The inside temperature can rise to 160 degrees very quickly. the banging to protect everyone from the intruding sounds. And some will head for the hills out of anxiety and fear. If your dog will be with you outside at a park, make sure to keep him on a leash if you do not know how he will react. People might set off fireworks anywhere and at anytime.